The life history pattern of a plant is revealed by the phenological studies . Plant phenologies are the result of interactions among biotic, abiotic and phylogenetic factors which determine the most effective timing for growth and reproduction . Various authors have reported that environmental factors affect initiation and duration of different phenological events like initiation of, synchronization and length of flowering and variation of flowering abundance [3,4]. In order to understand the reproductive ecology of plant species, knowledge of flowering phenology is crucial [5,6]. Since the schedule of flowering, reproductive expenditures and the timing of reproduction across time can strongly influence individual fitness so flowering phenology is a vital life history trait [7,8]. Moreover, the cycles of leaf fall and leaf flush are associated with processes such as growth, gas exchange and plant water status, so the phenology of vegetative stages is also essential . Varying factors like temperature variation, water availability, seasonality and photoperiod results in the difference in flowering phenology recorded during different years . With increasing altitude exposure to lower temperatures, short growing seasons, compressed flowering phenology, and restricted distributions are commonly witnessed in alpine environments . At high altitudes and high latitudes in the cold climates, plants adjust their vegetative growth and reproductive development to low temperatures and a short growing season [11,12]. Assessment of phenological behaviour of any wild plant species that is being targeted for cultivation is an essential step. Phenophases of species provides information about morphological and functional attributes that are helpful to understand adaptation features [13,14] and is also useful in developing standardized agro-techniques for the selected species . Phenological studies prove useful in developing management and conservation plans for valuable plant species [15-19]. The dearth of basic biological data has been found to be involved in the failure of numerous species recovery plans [20,21]. Ferula L. is the third largest genus of family Apiaceae consisting of 180-185 species . Ferula jaeschkeana Vatke locally known as “Yang or Krandel” is an herbaceous perennial plant growing 1-2.5 m tall with reddish brown stems . The species grows from plains to sub-alpine regions of Kashmir valley in disjunct populations on dry sunny slopes because of its susceptibility to cattle grazing, local usage, and other anthropogenic activities. Ferula jaeschkeana, being a vulnerable species [24-28], needs immediate conservation and protection. Owing to its immense medicinal and traditional importance and very little information available on its phenological behavior, the present study has been under taken with a conservation prospective for the first time. The present study aimed to understand the adaptation features of the species and to develop management and conservation plan for sustainable use of wild populations. Four naturally growing populations (Dachigam, Drang, Betab valley - Pahalgam and Gulmarg) and one transplanted population at KUBG (Kashmir University Botanical Garden) were selected for the present study. Randomly selected plants (fifteen plants at each study site) tagged in different populations were used to record the onset, duration, and completion of various phenological events. Various phenophases were recorded by continuous monitoring of these tagged plants throughout the growing season of the year. In all the selected populations, studies on the onset, duration, and completion of various phenological events viz. vegetative phase, sexual phase and senescence of aerial shoot were carried out. where i are individuals, j is time from anthesis to peak of flowering p, and r is the rank of each individual according to xi,j (the ratio of flowers that had already open in the individual by the jth census day to the total number of flowers opening in the individual during the season). A smaller value of R indicates earlier blooming. Where ej is the number of weeks individual i and j overlapped in their flowering; fi is the total number of week’s individual i was in flower, and n is the number of individuals in the sample. X varies from 0 (no overlap with any other individuals i.e., total lack of synchrony) to 1 (plant Ã¯Â¬Âowering overlaps with that of all other individuals i.e., perfect synchrony). The overall synchrony of the population (Z) is the average synchrony of individual plants. where xt is the number of flowers that flowered during time t, is the proportion of flowers flowering during time t of the total annual number of flowering flowers, n is the number of censuses per year, and pt is the proportion of the censured individuals in flowering during time t.
The data was subjected to one way analysis of variance (ANOVA) and caparison of the means was done with the Tukey’s test at p<0.05. A considerable variability in timing and duration of different phenophases was observed in all the studied populations along the altitude and different eco edaphic conditions (Figures 1 and 2). At higher altitudes, the plants enter into vegetative and reproductive phases comparatively latter than the plants growing at lower altitudes (Table 1). The phenological events studied include initiation and duration of sprouting, commencement of sexual phase, anthesis, fruit formation and senescence (Figures 3 and 4). The plants overwinter in the form of underground root tubers which remain dormant throughout the chilling winter months (November to February). With the inauguration of spring, the root tubers start to sprout and give rise to young shoots. Sprouting starts in the 2nd week of March and continues till 1st week of May in the natural populations while in the transplanted population the sprouting of the plants started during the 3rd week of February and continues up to 3rd week of March. Figure 1: Phenogram of Ferula jaeschkeana across different populations. Figure 2: Duration of different phenophases with respect to altitude at each study site in Ferula jaeschkeana. 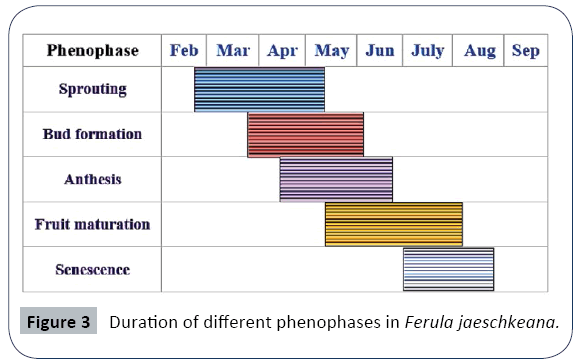 Figure 3: Duration of different phenophases in Ferula jaeschkeana. 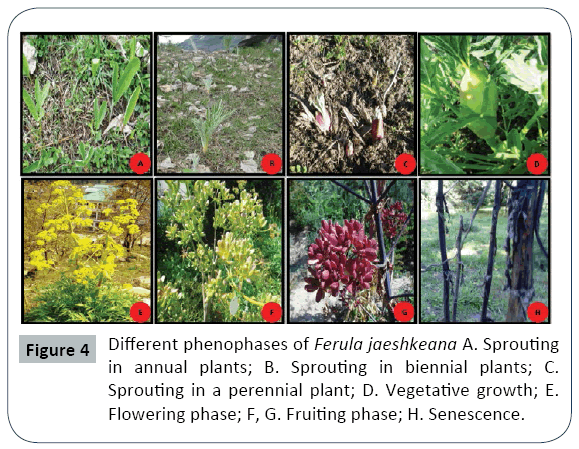 Figure 4: Different phenophases of Ferula jaeshkeana A. Sprouting in annual plants; B. Sprouting in biennial plants; C. Sprouting in a perennial plant; D. Vegetative growth; E. Flowering phase; F, G. Fruiting phase; H. Senescence. Table 1: Summary of phenological behaviour of Ferula jaeschkeana in natural and transplant conditions. The vegetative phase of the species is followed by an asynchronous sexual phase. The flowering occurs only in perennial plants while the annuals and biennials remain vegetative. Among the different populations studied, the transplanted population growing at comparative low altitude were the first to enter the sexual phase during the 3rd week of March and continue the floral bud formation upto 1st week of April. However, the high altitude natural populations enter the sexual phase late during 1st week of April and the completion of bud initiation is witnessed upto 4th week of May. The flowers begin to open in the 4th week of April and continue up to 2nd week of June in natural populations while as in the transplanted population, it starts from 2nd week of April and continues up to 1st week of May. The Ã¯Â¬Âowering in the populations lasts for 3-4 weeks. The highest percentage of flowering plants was recorded between May and early-June. The anthesis is slightly asynchronous within population and highly asynchronous across populations. Within an umbellule anthesis starts from periphery and proceeds centripetally while within the plant it starts from the central umbels followed by lateral umbels. The number of umbels per branch has a strong positive effect on umbellules per umbel (r2=0.93) and the flowers per umbellule (r2=0.808) (Figure 5). Figure 5: Correlation of morphological characters of Ferula jaeschkeana in the selected populations. The phenological variables of Ferula jaeschkeana showed a decreasing trend along the altitude (Table 2). Among the natural populations moment, duration, amplitude and intensity were highest in the low altitude population of Dachigam (12.3 ± 1.53, 21.66 ± 1.53, 2291.66 ± 282.9 and 10208 ± 524.7 respectively) and lowest in high altitude Gulmarg population (10.33 ± 1.5, 14.33 ± 0.58, 416 ± 55.83 and 2676.3 ± 570.5 respectively). In the transplanted population (KUBG) the values of moment, duration, amplitude and intensity were found to be 16 ± 2, 25 ± 1, 1532.66 ± 146.7 and 7926.6 ± 551.4 respectively. Table 2: Phenological variables of Ferula jaeschkeana in the studied populations. Flowering phenology index of Mahoro (Ri) was calculated for both natural as well as transplanted populations. A comparison revealed that the value of Ri was highest (13.07 ± 1.0) in Gulmarg population while it was found to be minimum (6.39 ± 0.53) in the transplanted population (KUBG). The smaller the value of Ri, earlier is the blooming. Therefore, blooming occurred earlier in transplant KUBG population while as the high altitude Gulmarg population bloomed at the end (Table 3). The overall flowering synchrony (Z) peaked at 0.65 ± 0.04 in KUBG, 0.68 ± 0.01 in Dachigam, 0.74 ± 0.04 in Drang, 0.78 ± 0.07 in Betab Valley population and 0.84 ± 0.12 in Gulmarg population. Flowering synchrony index of Marquis (S) value peaked at 9.46 ± 0.44 in Gulmarg population and was minimum in Dachigam population (4.65 ± 0.60). In transplanted population, value of S was found to be 4.40 ± 0.60 (Table 3). After the process of pollination is complete, fruit development starts from 3rd week of May and continues up to 1st week of August in natural populations. However, in case of transplants, the maturation of fruits starts in 2nd week of May and continues up to 3rd week of June. Fruit development is also asynchronous within population and across populations. The colour of the stem and fruits also changes from green to reddish brown. Table 3: Summary of flowering phenology index of Mahoro (Ri), overall synchrony of Augspurger (Z) and fÃ¯Â»Â¿lowering synchrony index of Marquis (S) in Ferula jaeschkeana. After the fruit maturation, the species shows a slightly asynchronous senescence of the above ground shoots. In low altitude KUBG population senescence starts in 4th week of June and lasts up to 2nd week of July. In case of natural populations, senescence occurs from 1st week of July and lasts upto 3rd week of August. The duration of aerial shoot was short ranging from 115- 125 days in natural populations and 145 days in the low altitude KUBG population. Under transplant conditions the total life span (aerial shoot) was considerably longer as compared to the life span in higher altitude populations. The species exhibited a life span of 115-145 days from sprouting to senescence of the aerial shoot across the studied populations. Thus, the species revealed a life span of about four months to complete its life cycle in its natural habitat, however plants at lower altitude transplanted population completed their life cycle in five months. A considerable variability in timing and duration of different phenophases was observed in all the studied populations. Lindsey  observed the flowering period in various members of family Apiaceae and he also reported that flowering occurs in spring between late March and early June depending on latitude and altitude. With rise in elevation, delay in flower onset timing and contraction in flowering duration was observed which is in agreement with Crimmins et al. but anomalous behaviour from normal trend is also reported . The present study revealed that at lower altitudes the plants flower comparatively earlier than the plants growing at higher altitudes which is in agreement with Ziello et al. . To be successful in such a harsh environment, plants need to cope with temperature extremes while actively growing [39,40], to maintain metabolism over a broad temperature range [41,42] and to complete development quickly. The flowering and fruiting phenology may have an important influence on reproductive success, as it determines reproductive synchrony among potential mates  and may influence the attraction of pollinators and seed dispersers . The number of plants with which an individual may interchange genes is determined by the level of flowering overlapping among individuals . In the studied population, the mean synchrony of 74.5% puts some restrictions on gene flow among individuals. However certain degree of asynchrony between flowers and higher flower number per plant ensures the long-term availability of pollen to certify effective pollination as also supported by Siddique  and Wyatt . Flowering asynchrony within populations may also act to reduce intraspecific competition for pollinators and promote outcrossing . A considerable variability in timing and duration of different phenophases was observed in all the studied populations in different eco edaphic conditions. Under transplanted conditions the total life span of the aerial shoot was considerably longer as compared to the life span in higher altitude natural populations. 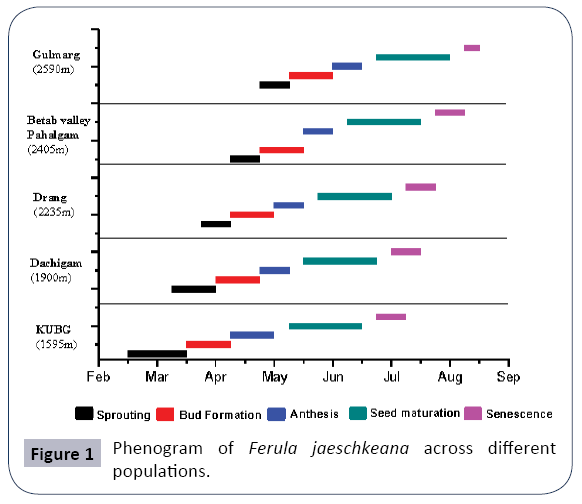 The phenological variables and indices of Ferula jaeschkeana showed a decreasing trend along the altitude. Flowering and fruit development was also asynchronous within population and among populations. The species exhibited a life span of 115-145 days from sprouting to senescence of the aerial shoot across the studied populations. This information is valuable for understanding ecological features, phenological behaviour, planning economically viable cultivation and developing strategies for effective conservation and management of the wild populations. The first author is grateful to Council of Scientific and Industrial Research (CSIR) for providing financial assistance as JRF. Manjikola S, Dhar U, Rawat RS (2005) Phenology and biology of Arnebia benthami a critically endangered medicinal plant of Kashmir Himalaya. Proc Nat Acad Sci 75:283-287. Wright SJ, Calderon O (1995) Phylogenetic patterns among tropical flowering phenologies. J Ecol 83:937-948. Inouye DW, Saavedra F, Lee-Yang W (2003) Environmental influences on the phenology and abundance of flowering by Androsace septentrionalis (Primulaceae). Amer J Bot 90:905-910. Dominguez CA, Dirzo R (1995) Rainfall and flowering synchrony in a tropical shrub: variable selection on the flowering time of Erythroxylum havanense. Evol Ecol 9:204-216. Ollerton J, Lack A (1998) Relationships between flowering phenology, plant size and reproductive success in Lotus corniculatus (Fabaceae). Plant Ecol139:35-47. Kelly CA (1993) Quantitative genetics of size and phenology of life-history traits in Chamaecrista fasciculata. Evol47:88-97. Fenner F (1998) The growth and reproduction in plants. Perspectives in Plant Ecology, Evolution and Systematic 1:78-91. Rathcke BJ, Lacey EP (1985) Phenological patterns of terrestrial plants. Ann Rev Ecol Syst16:179-214. Reich PB (1995) Phenology of tropical forests, patterns, causes and consequences. Can J Bot73:164-174. Parmesan C (2007) Influences of species, latitudes and methodologies on estimates of phenological response to global warming. Glob Chang Biol 13:1860-1872. Larcher W (1980) Klimastre B im Gebirge-Adaptation straining und Selektionsfilter fiir Pflanzen. Rheinisch-Westfidlische Aka-demie der Wissenschaften. N 291. Leverkusen, Westdeutscher Verlag, pp: 49-88. Korner C, Larcher W (1988)Plant life in cold climates. In: Plants and Temperature. Long SE, Woodward EI (eds. ), Symposium of the Society for Experimental Biology. Cambridge, Company of Biologists 42:25-57. Nautiyal BP, Prakash V, Chauhan RS, Purohit H, Nautiyal MC (2001) Assessment of germinability, productivity and cost benefit analysis of Picrorhiza kurrooa cultivated at lower altitude. Curr Sci 81:579-585. Nautiyal MC, Purohit AN (2000) Cultivation of Himalayan aconites under polyhouse conditions. Curr Sci78:1062-1063. Vieira BC, Silveira FAO (2010) Reproductive phenology, seed germination and ex situ conservation of Pseudananassagenarius in a semi-deciduous tropical forest fragment. PlantSp Biol25:214-220. Hamann A (2004) Flowering and fruiting phenology of a Philippine submontane rain forest, climatic factors as proximate and ultimate causes. J Ecol92:24-31. Reich PB, Uhl C, Walters MB, Prugh L, Ellsworth DS (2004) Leaf demography and phenology in Amazonian rain forest, a census of 40 000 leaves of 23 tree species. EcolMonographs74:3-23. Sanz-Cortes F, Martinez-Calvo J, Badenes ML, Bleiholder H, Hack H, et al. (2002) Phenological growth stages of olive trees (Olea europaea). Ann App Biol140:151-157. Wafai BA, Siddique MAA, Beigh YS, Dar NA (1996) Reproductive biology of petris (Aconitum heterophyllum wall. ex. Royle; Ranunculaceae) an important rare and threatened Himalayan drug plants, Y.S. Parmar, University of Agricultural Science, Solan, HP, India. Boersma PD, Kareiva P, Fagan WF, Clark JA, Hoekstra JM (2001) How good are endangered species recovery plans? BioSci51:643-649. Yaqoob U, Nawchoo IA (2015) Conservation and cultivation of Ferula jaeschkeana Vatke: A species with deep complex morphophysiological dormancy.Proc Natl Acad Sci, India, Sect. B Biol Sci. Yaqoob U, Nawchoo IA, Ahmad M (2016) Phytochemical screening of the root tuber extracts of Ferula jaeschkeana Vatke. JEOBP. Chawla A, Parkash O, Sharma V, Rajkumar S, Lal B, et al. (2012) Vascular plants, Kinnaur, Himachal Pradesh, India.Check List 8:321-348. Kumar GP, Kumar R, Chaurasia OP, Singh SB (2011) Current status and potential prospects of medicinal plant sector in trans-Himalayan Ladakh. J Med Plants Res 5:2929-2940. Pant S, Pant VS (2011) Status and Conservation Management Strategies for Threatened Plants of Jammu and Kashmir. J Phytol 3:50-56. Chawla A, Rajkumar S, Singh KN, Lal B, Singh RD (2008) Plant Species Diversity along an altitudinal gradient of Bhabha Valley in Western Himalaya.J Mt Sci 5: 157-177. Kala CP (2005) Indigenous uses, population density and conservation of threatened medicinal plants in protected areas of the Indian Himalayas. Cons bio 19:368-378. Dafni A (1992) Pollination ecology. A practical approach. IRL, Oxford, UK. Herrera J (1986) Flowering and fruiting phenology in the coastal shrublands of Doñana, south Spain. Plant Ecol 68:91-98. Newstrom LE, Frankie GW, Baker HG, Colwell RK (1994) Diversity of long-term flowering patterns. In: McDade LA, Bawa KS, Hespenheide HA, Hartshorn GS (eds. ), La Selva, Ecology and Natural History of a Neotropical Rain Forest. University of Chicago Press, Chicago, pp: 142-160. Mahoro S (2002) Individual flowering schedule, fruit set, and flower and seed predation in Vaccinium hirtum Thunb. (Ericaceae). Can J Bot 80:82-92. Augspurger CK (1983) Phenology, flowering synchrony and fruit set of six neotropical shrubs. Biotrop 15:257-267. Marquis RJ (1988) Phenological variation in the neotropical understory shrub Piper arieianum, causes and consequences. Ecol69:1552-1565. Lindsey AH (1984) Reproductive biology of Apiaceae. I. Floral visitors to Thaspium and Zizia and their importance to pollination. Am J Bot 71:375-387. Crimmins TM, Crimmins MA, David BC (2009) Flowering range changes across an elevation gradient in response to warming summer temperatures. Glob ChangBiol15:1141-1152. Gimenez-Benavides L, Escudero A, Iriondo JM (2007) Reproductive limits of a late-flowering high-mountain Mediterranean plant along an elevational climate gradient. New Phytol 173:367-382. Ziello C, Estrella N, Kostova M, Koch E, Menzel A (2009) Influence of altitude on phenology of selected plant species in the Alpine region (1971-2000). ClimRes 39: 227-234. Larcher W, Kainmuller C, Wagner J (2010) Survival types of high mountain plants under extreme temperatures. Flora 205:3-18. Taschler D, Neuner G (2004) Summer frost resistance and freezing patterns measured in situ in leaves of major alpine plant growth forms in relation to their upper distribution boundary. Plant Cell Environ 27:737-746. Korner C, Diemer M (1987) In situ photosynthetic responses to light, temperature and carbon dioxide in herbaceous plants from low and high altitude. Funct Ecol 1:179-194. Larcher W, Wagner J (1976) Temperaturgrenzen der CO2- Aufnahme und Temperaturresistenz der Blatter von Gebirgspflanzen im vegetationsaktiven Zustand. Oecol Plant 11:361-374. Augspurger CK (1981) Reproductive synchrony of a tropical shrub, experimental studies on effects of pollinators and seed predators on Hybanthus prunifolius (Violaceae). Ecol63:775-788. Siddique MAA (1991) Germplasm assessment of some rare and threatened medicinal plants of Kashmir Himalayas. PhD Thesis. University of Kashmir, Jammu and Kashmir, India. Wyatt R (1982) Inflorescence architecture. How flower number, arrangement and phenology affect pollination and fruit set. Amer J Bot69:585-594. Rogstad SH (1994) Biosystematics and evolution of the Polyalthia - Hypoleuca species complex of Malesia 3. Floral ontogeny and breeding systems. Amer J Bot 81:145-154.